You know how sometimes you need to see the grace with which someone else handles their challenges to give you perspective on your own? Well. Meri Schuhmacher has always done that for me. I don't know Meri, but I have been a faithful reader of her blog, Our Diabetic Life, for quite some time now. If you're not familiar with her, she is the mother of four boys, three of whom have Type 1 Diabetes. She can guesstimate carb counts by phone, mentally keep track of the basals of all three boys, and more... your basic Superwoman D-mom. Right now, this Supermom's family needs our prayers. Meri's husband Ryan recently received a diagnosis of brain cancer. He has numerous brain tumors and it's a grave situation. The DOC (*Diabetic Online Community) is wrapping it's arms around the Schuhmacher family. 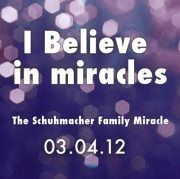 You can follow the Schuhmacher Family's Miracle on Facebook. You can donate money to help with their medical bills. And most importantly, you can lift this family up in prayer. They are a family of strong faith, and Meri has written that they are already feeling a sense of calm and choosing to focus on hope. I am cross posting this post on both of my blogs because I want to spread the word and prayerfully support the Schuhmachers as much as possible.